Update @ 11:14 AM - Appears to be just one ticket left. Verifies when trying for 1 passenger, but no longer with 2. Update @ 4:15 PM - Looks like there's also one ticket from Dec 16-23 available at $229 roundtrip after taxes. 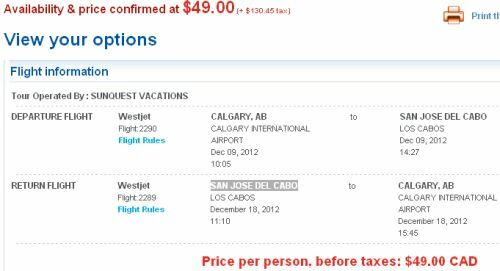 There are a couple of last minute seats from Calgary to San Jose Del Cabo, Mexico (SJD) available for the ridiculous price of $179 roundtrip after taxes. They're being offered through SunquestVacations, on a Westjet charter flight. The price initially shows up as $279 roundtrip after taxes, but then drops to $179 roundtrip after taxes on the confirmation screen. If you can get to the confirmation screen (shown below), the tickets are still available. If you get an error message, it means they've sold out. They're not likely to last long, since there's likely not a whole lot of them available for this price. It can be worth trying for just one passenger if you can't get the price to verify, but as of this posting, I can get it to verify for 2 passengers. The flight is not available at this price through Westjet.com, because it is a charter flight. Congrats to whoever can scoop them up! 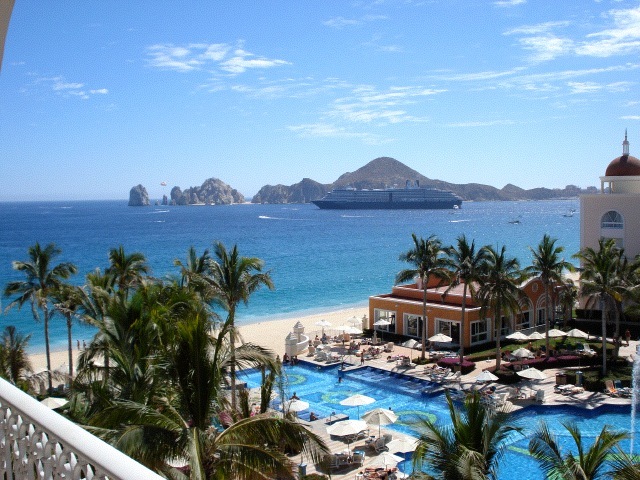 calgary, yyc, flight deals, westjet, mexico, sjd, cabo san lucas and sunquest vacations.